felt others needed to know how devastating mold can really be. It has taken me nearly nine years to complete the book. 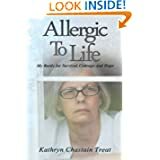 Allergic to Life: My Battle for Survival, Courage, and Hope is now available through Amazon, Barnes and Noble, and signed copies will be available on my website for those in the US only. It is my hope that my words will help others struggling with mold exposure or chemical sensitivity realize that they can still make a life for themselves, albeit a different life. It is also my hope that family members, friends, and those in the medical field will come to understand what life is like after mold exposure. Congratulations upon the completion of your book. I’m so sorry for “all” you have had to endure. God bless you, Kathy! Thank you. I am excited about finally getting to this stage but nervous as well as I am the one to promote and market it. Yes, you’re amazing for sharing your story. So so helpful to others like myself. This is a link to my mould poem that I have now workshopped in my poetry class; it’s different and clearer (than when you last read it). My teacher said that it would not make sense to the average person, so now I think it will. Let me know what you think, as you are definitely an expert in the mould area! The link isn’t in your comment. Thank you so much for the nomination. I am flattered and glad that I am making a difference. hello and welcome k.m.- i use watercolor, ink-waterbased and some acrylic [no cobalts, pthalates…]when i can paint with open windows. i also own a high-powered .001micron filter air purifier capable of pulling VOC’s out of the room. It is made by IQAir and is the best room air purifier you can buy. I do not paint everyday or even every week and if i am showing any symptoms, i certainly don’t use the acrylic. hope that helps…i know it’s not easy and am always happy to answer any questions. Thank you for responding. I don’t paint – can’t draw stick people very even. Another friend of mine who has environmental illness as well used to paint and I wanted to see what you used so that maybe it was something she could also use. I am sorry you are not well. I am dealing with one of my sinus infections right now. I understand not feeling well. Today I am pushing the limits in an effort to get my home cleaned before my daughter arrives and the holidays begin. Not that I have lots of company but it will make me feel better. Tomorrow I will be paying for it I am sure. Thank you for the Blog of the Year 2012 award. I am honored and will work on my nominees, etc. in a few days when all the dust settles down around here. Thankfully my allergies are not debilitating at present. I know that can change. My husband can go into anaphylactic shock if he takes penicillin. Mine are mostly food related plus hayfever. I saw my doctor for a chronic cough. The nurse in me worried about TB. I was surprised to find out it was allergic bronchitis. The Dr. did not feel it was worth it for me to go through all the testing to find out the cause. I thought about what I ate on a regular basis – Pepsi was the culprit. I never considered I was actually addicted to the stuff. You should have seen me on my 4th day deprived of Pepsi. It was similar to drug addition. By the 6th day I was fine and can laugh about the experience. I can drink one Coke and not have the same “side effects.” It takes 3 Cokes for that to happen. I stopped drinking cherry sodas when I was a teenager because it made me giddy and drunk. Now, I drink mostly water, green tea and juices. Welcome to my blog. Thanks for joining. I am hoping to have my book out this spring. Currently I am battling the book cover. Once I can nail something down and have it designed I am ready to go. I am looking forward to reading your posts. I just developed a long list of allergies a few years ago. I still don’t know what triggered mine, so it’s so interesting reading about this experience of yours! I am so sorry to hear that you, too, suffer from all these allergies and sensitivities. Thank you for signing on to follow me. Thank you Rachel. My brain is somewhat fuzzy from getting my LDA treatment and my concentration is not great. I am going to the link and will post it in my drafts so I don’t forget. I love how the treatment helps me but don’t like a day or too of the headache, itching and fuzzy head. Congrats on your book getting ready to come out. I can’t wait to check it out! Great blog, by the way. I think it’s great that you, and others like you, share your stories about allergies. A society that is more aware about food allergies makes for a better world for my allergic sons. Absolutely! The more we promote awareness the better. With each post if we all can just reach one person, imagine how many would be more aware? I am learning so much by following other blogs that discuss allergies and sensitivities. As I have written before, this is not a cookie cutter illness. We all have various degress in the way we react and to what we react. I have several friends with multiple chemical sensitivity and yet our reactions and our what we react to varies so much. Thank you for commenting. I am now following your blog. My son and I have pretty much the same story as you. Almost 2 years ago we were exposed to high concentrations of a severely aggressive toxic mold while renovating our new home. The spiral into chronic illness, allergies, food sensitivities, environmental sensitivities, weight loss and loss of all identity has destroyed us both and we now exist together in our own strange little world that everyone just doesn’t understand. We’ve both lost over 120 lbs each and can barely tolerate any foods at all. The insomnia has destroyed me as I only sleep abut 4 hours a night max and have become unable to handle interaction with people from the “outside”. I never realized it was Aspergillosis until our new allergies to all yeasts got overwhelming and even walking into a bakery set me off on weird spells of dizziness and feelings of persecution and hostility out of nowhere. I’d been getting hoarseness in my throat and lost my singing voice completely which spiraled me into a further depression. Once I started hacking up black plegm from my throat I knew this was out of control and if I swallowed any my stomach would get sick like food poisoning. My internist found my right maxillary sinus was solid with concretion and an obstruction. The antibiotics have only made me feel slightly better, but I can feel I push this pathogen backwards, only for it to surge forward and take a stronger hold. I wish we’d caught this sooner than we did as my son’s weight loss and paleness now worry me more than my own failing health and seeing him withering away with no way to help him has me on the edge of giving up. Thank you for raising awareness of this life destroyer. Maybe people will find their way to the truth through your posts and book. If I had found this 16 months ago maybe I could have save us both. At this point the ringing in my ears has become so sever I can barely think. Why didn’t we wear protective masks?…… I wish life had a do over button. John – This saddens me to hear your story. It is one I have heard so many many times. All of us would like a do over button if it could have prevented our exposures and downward spirals. I had the black threads coming from my sinuses. Have you seen an ENT to have your sinus cultured? You need both a bacterial culture so make sure that if you need an antibiotic you are on the correct one to avoid having to switch from one to another as well as a fungal culture done. While antibiotics are sometimes necessary they also can make fungus go crazy. I have been on an antifungal for a very long time. I always have to up the dose when forced to take an antibiotic for one of my sinus infections. A fungal culture can take six weeks for a result to come back. Having a fungal sinus infection and always getting it to grow in a culture dish is difficult. Despite the black threads coming from my sinus, it took several cultures before we had it grow in the dish and be identified. May I ask you when the sensitivities started? Were they after you got out of the mold? You ask why you didn’t wear protective masks. Hindsight is amazing isn’t it. Why didn’t I ask why they burned candles sometimes in the office I started to work in? Why didn’t a red light go off in my head that the candles were most likely masking something that wasn’t good? The answer for me was that I was so darn excited to start back to work after years of raising my daughters that I totally ignored it. You and your son were most likely very excited to renovate your new home and didn’t think anything negative would happen either. That is why I have written my story and that is why I have this blog. I write to let others know they are not alone in this battle and I write so that others may know what mold can do and perhaps save someone from getting an exposure. I hope that you continue to follow and comment when you feel up to it. I have a great group of followers who have experienced chemical sensitivity from various sources including the mold as well as those with food and gluten sensitivities and intolerances. We are all here to share and support each other. Thank you for your kindness and support!! It means a lot. Thank you so much Katie. I plan on announcing it in the next couple of days. Thanks for sharing your story! Such an inspiration! Thank you for stopping by and following me. I hope you continue to comment. Hello- I always appreciate knowing I’m not alone! This is the third major health crash I’ve gone through and I’m being helped by a mutual doc who passed on your info. With every crash, the beginning seems the most horrific and financially overwhelming. There are times you wonder whether you will truly live to tell about it! Cathie – Thank the doctor for sharing my information with you. It seems that each time we crash or have another health crisis, it is harder to fight our way back to any semblance of normal. I often wondered if I would make it through a reaction and live to tell about it. I am so glad that I have survived to tell my story. Thank you for sharing your story with us. I too worked in a mold infested classroom for a couple of years. But that was enough for me to get allergies and acute sinusitis. I’d love to read your book. Where can it be purchased? Elizabeth – the book should be available in the next few months. I will post all the information here as soon as it is available. Sorry to hear about your exposure. It is a shame how many schools have mold. There were things I should have listened to when I started to work but the excitement to be back to work overrode what I should have been listening to. Please let us know when it is out. I’d like to read it. About your exposure- I am sorry that you have to go through this. However, I am happy that you are sharing your story with all and thanks again for doing this. I think writing and sharing your story is a form of healing. I sincerely wish your health improves. Thank you Elizabeth. I spoke with my check-in coordinator. Everything is being forwarded for evaluation and we will discuss all final items next week. The light at the end of the tunnel. Writing in the form of journaling and the actual writing of the book have had a wonderful healing effect on me. Hidi ho! Another award for you. Thanks for writing! Thank you Rachel. I will respond to it this coming week. Hi Kathryn! I nominated you for both the “Rose of Kindness” and “Unique Leaves” awards. Thank you so much for being so kind and supportive! It means the world. Hi Kathryn, Thanks for calling by my blog as part of the IU block party. Good luck with your book signing! Hello! I have nominated you for the “Most Influential Blogger” award! Click on the link below to find out more on this special award. Congratulations!! Thank you Jenny. I hope to get my act together so that I can properly accept the last few awards I have been given. My brain and body seem to be going in different directions lately. I have definitely been there before. I had to lasso my brain and get it to focus on getting the four awards posted, lol! Jenny – I just realized that I didn’t reply to this comment. Thank you so much. I finally took the time and did this one. I don’t know if I will ever manage to go back and find the others and respond. But I can start fresh from now on. Thank you Jenny. My plate is pretty full as you will soon see in my posts over the next two weeks. I am going to make a note on my calendar to do this after the middle of the month. As part of my trying to be better about responding to these awards, I will begin drafting the post in between all the craziness that is coming. Thank you very much Katie. I will respond to it as soon as I can. Congratulations on publishing your book! I wish you all the best! You are very welcome. That is my reason for writing this blog and for writing my story. I felt compelled to bring awareness to the dangers of mold and what life is like with environmental and chronic illnesses. Bless you and thank you for taking the time to comment. Your book looks so encouraging, inspiring. Thank you so much Mandy. It is my hope to bring awareness through my story. Thank you for commenting. Some of the treatments I have heard of and some I have tried. I have used oregano oil, olive leaf, and garlic. I even tried the silver but I actually reacted to it and it didn’t help me. I haven’t tried the hyperbaric chamber. We had one in a local hospital but I think they have closed the wound healing center. It was in the basement of a very hold hospital and I couldn’t have tolerated the building any way. I appreciate all that you have shared and hearing what has helped you. You have to be careful with the PEMF if you have a tendency to have sensitivity to electromagnetic fields.